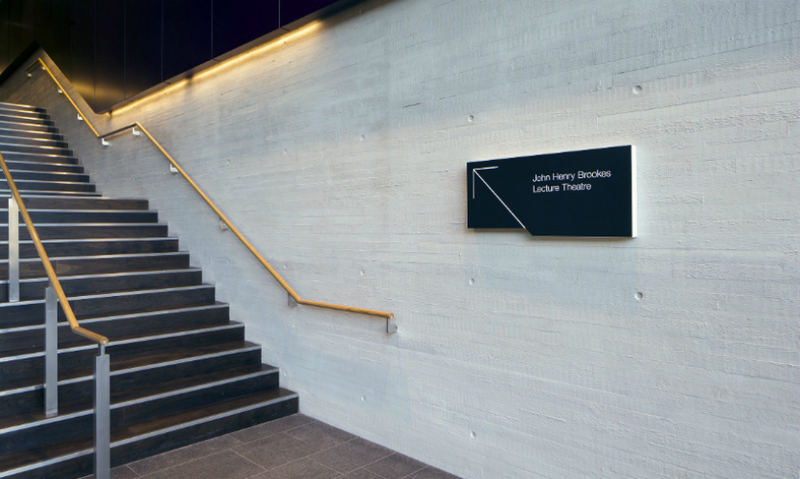 As part of the university’s “Space to Think” initiative, Holmes Wood designed a new wayfinding scheme for the new award-winning John Henry Brookes building designed by Design Engine. 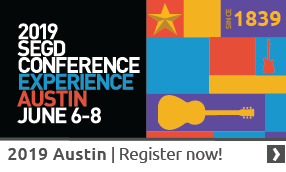 Holmes Woods’ strategy covered every element of information design, from location, content, nomenclature structure, typography and iconography to bespoke product design, procurement, and installation. The team worked closely with the architects to create designs that through shape, material, and color integrated seamlessly with their bold interior design solutions. 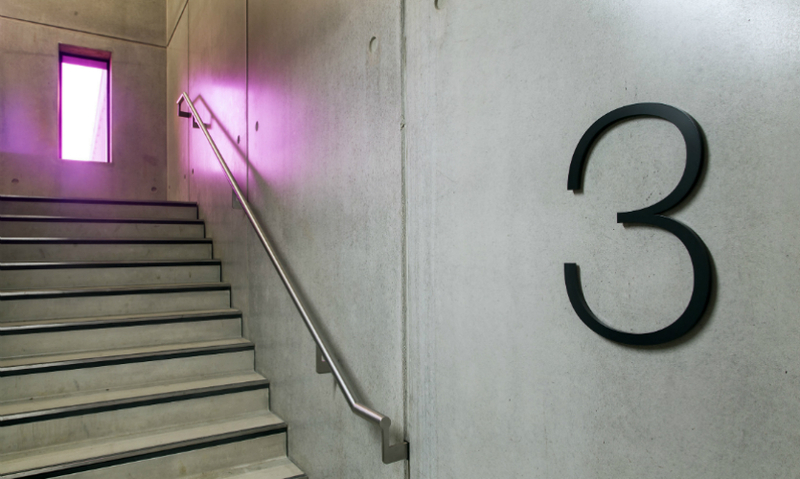 The university wanted the building and all elements of its design to reflect a new attitude to teaching and ensure that students and prospective students felt that Oxford Brookes had not only modernized, but was setting the benchmark. 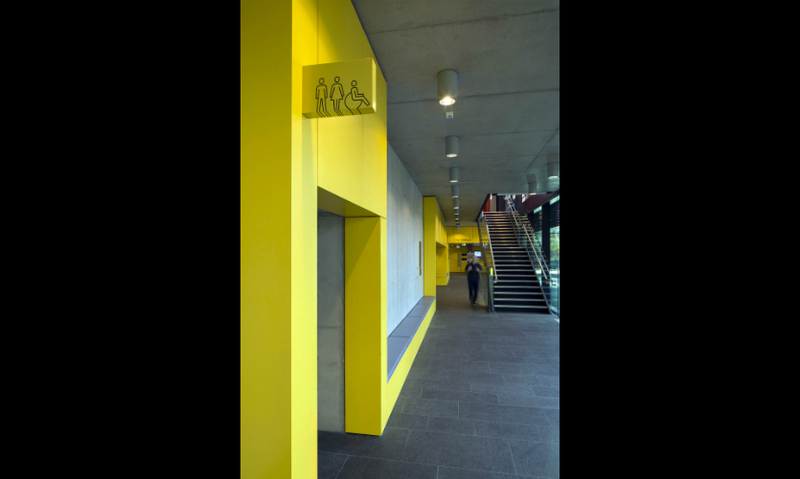 The Holmes Wood team spent a lot of time with stakeholders, some of whom had worked at the university for many years, understanding the potential issues in the building and explaining how the wayfinding strategy would work in comparison to their normal approach. From early on, the team decided to reduce the number of signs that were typically installed in their buildings and give the students dedicated areas for posting their own notices. 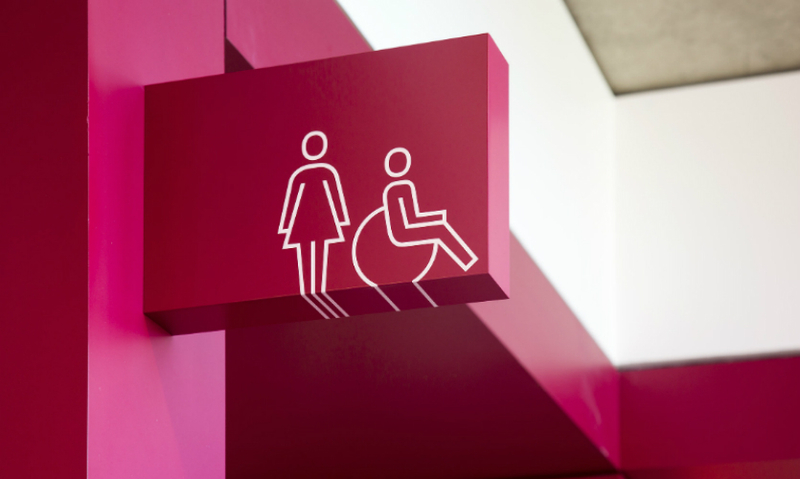 The team also needed to solve the problem of connecting the new building with old buildings that were not having their wayfinding schemes updated at the same time. Holmes Wood created clear entry portals to the new building and updated information in transient areas to allow people to move between old and new campus spaces. 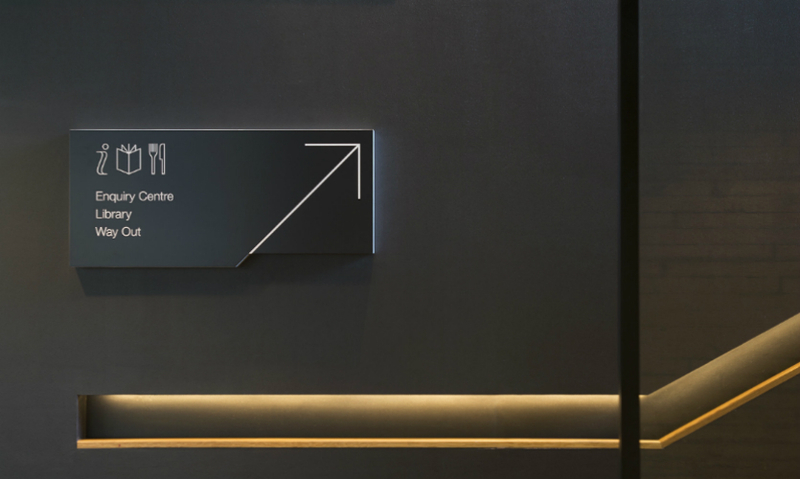 The sign form draws reference from the university brand and the new architecture, and integrates with the varying brightly colored interiors. 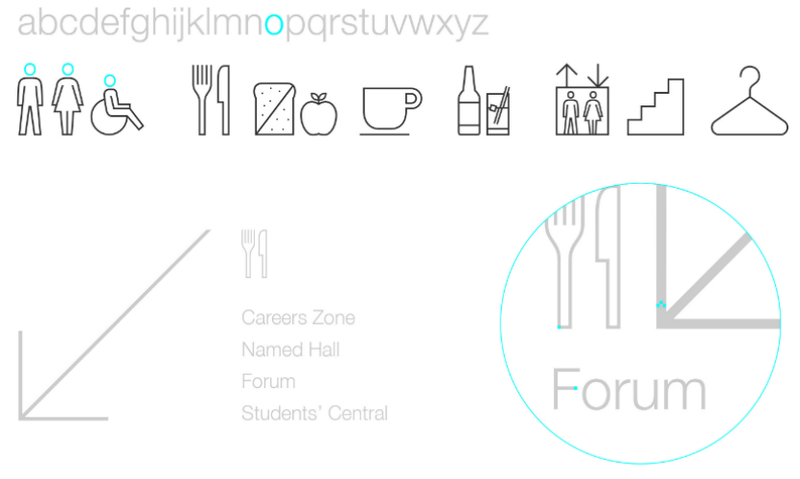 Bespoke pictograms bring character and personality to the signs and work with the university font, Helvetica. 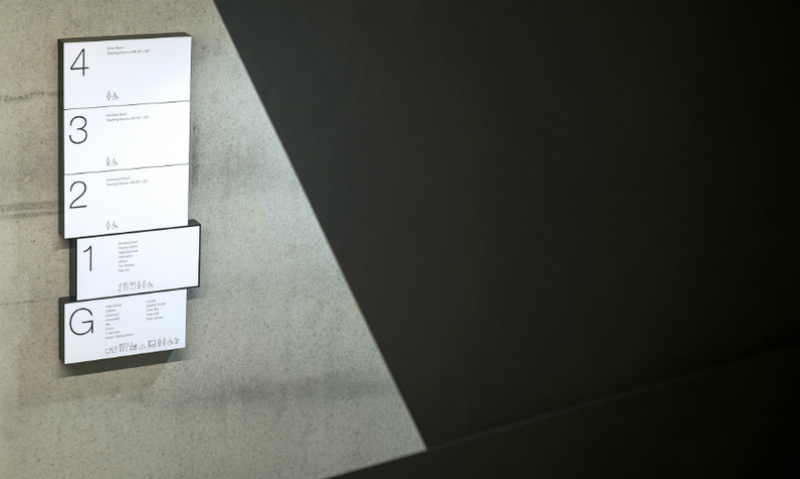 The wayfinding scheme is convincingly “on brand” while looking engaging and connected with the radical new architectural approach the university was taking.